1. 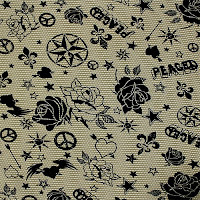 A funky new pattern with black graffiti stamps on an olive textured cotton jersey poly blend. This fabric has less stretch than most of our knits, so would work for woven patterns like the Rosa Shirt from Tilly and the Buttons. 2. 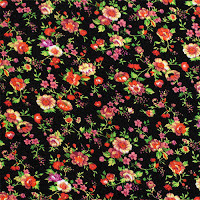 A beautiful bright floral vine pattern on black cotton jersey, perfect for a stunning Wardrobe by Me Diana Wrap Dress. 3. 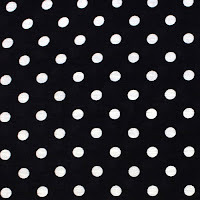 A classic black and white polka dot cotton jersey, sure to sell out quickly! This would make a great Bettine Dress. There is still time to receive this fabric and sew it up before Christmas, so if you see something ideal for a gift, then order now! We also have a limited run new fabric! We have 18m of the graffiti stamp pattern on a camouflage cotton jersey. This is a very stable, heavy weight, almost woven style knit fabric, so great for either woven or knit projects. There are some very minor print flaws which means this fabric is reduced by 50% so grab some quick before it sells out! 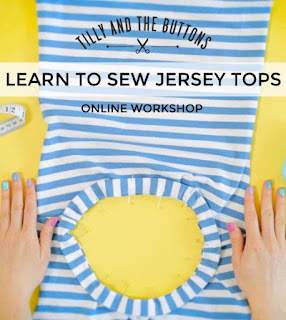 There is still one week left to get 10% off the fantastic Tilly and the Buttons Learn to Sew Jersey Tops online workshop. Simply click the image for more information and enter the code GIRLCHARLEE to get 10% off. The course includes the gorgeous Agnes Top Pattern so it really is a great deal! 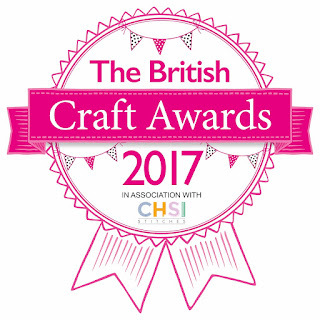 There is also still just over a week left to vote for us in the British Craft Awards as Fabric Retailer of the year. You could win £100 of Amazon vouchers just for voting and it only takes 2 minutes! Voting closes 20/12/2016.